Fogcreek used to be a fairly well-known company due to Joel Spolsky’s famous blog. I recently came across their hosted version control product: Kiln. While Kiln looks nice, I don’t find anything about it that makes it stand out from Github or Bitbucket. Given that, what I find absurd is their insane pricing. 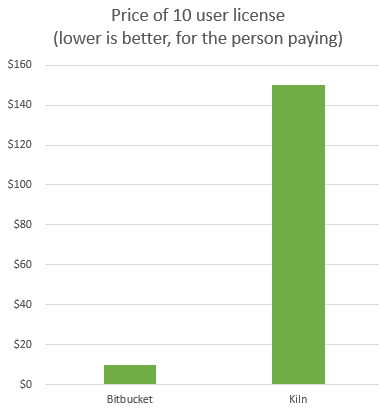 So a 10 user license costs $100 per month. Not only that, they charge $50/month extra if you want to do code reviews. 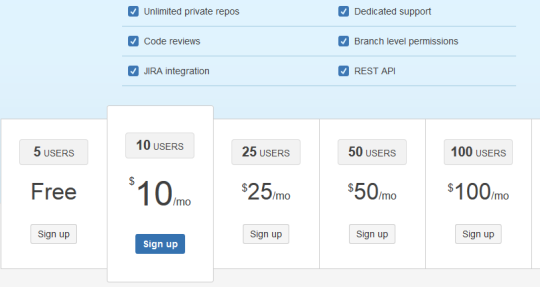 A 10 user license at BitBucket costs $10, and that includes code reviews. In fact a $100/month license at Bitbucket buys you 100 users! And that is still below the $150 you have to pay Fogcreek to get a 10 user license with the code review module. The pricing of Fogcreek Kiln is absurd. It is 10x higher than BitBucket which is vastly more popular and more integrated into 3rd party tools. Considering that Kiln has no real killer feature to show for its price, it doesn’t seem like there is any reason to choose it over the alternatives.